This July, OPI is launching their new Ford Mustang Collection*, and today I have three polishes from this line to share with you! Each shade is inspired by the Ford Mustang Brand, and while I know nothing about cars, I still love all of the shades in this collection! 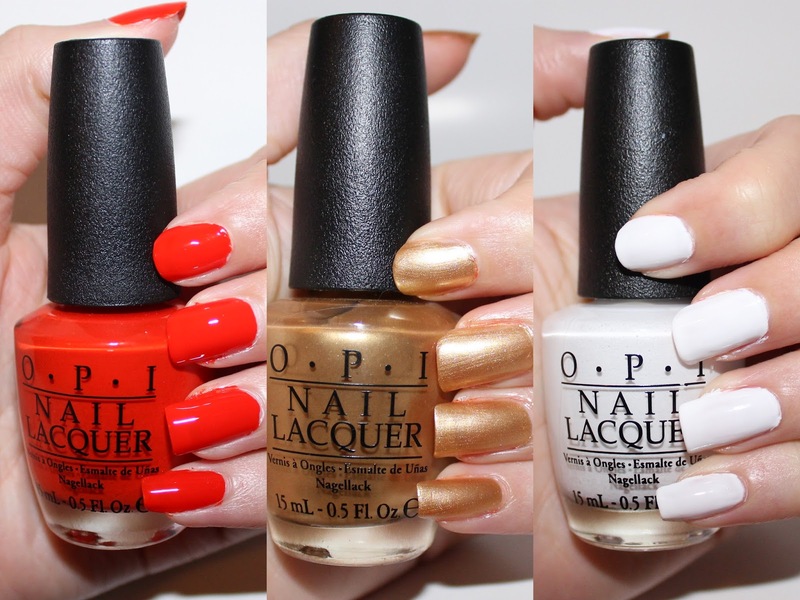 OPI 50 Years of Style "Celebrate all your milestones in this made-to-party golden pearl." Ford recently celebrated 50 years of continuous vehicle production, and this shade is meant to celebrate this golden milestone! I think that it would be amazing to have a gold car, don't you agree? Once again, this polish has an amazing creamy formula, 2 thin coats is all you need. Metallic polish sometimes have a tendency to be streaky, but I didn't have any issues with 50 Years of Style. OPI Angel with a Leadfoot "Drive on up and say “halo” to this celestial white." This white polish is supposed to represent the power that a woman feels when behind the wheel of a Ford Mustang. This white is bold, and definitely makes a statement. For a white polish, I was definitely impressed with the formula and pigmentation. Two coats gave me great opacity without any streakiness! OPI Race Red "I’ll be wearing this hot pepper red in the winner’s circle." This polish was made as a tribute to the classic Ford Mustang red shade. This red has slight orange undertones, and the formula was pretty much perfection. Two thin coats gave me an opaque, incredibly shiny finish. The orange undertones make this red more wearable for my pale skin tone, as I tend to find pure red polishes too bold. All three shades have a very impressive formula! I wouldn't say that any of these shades is super unique, but the formula makes them worth picking up and adding to your polish collection. Well done OPI! Are you a Ford girl? Which shade from this new collection are you most excited about? I love the colours in this collection! The gold and the red are gorgeous! Love the white! My collection lacks a good white! I was really impressed with this collection!